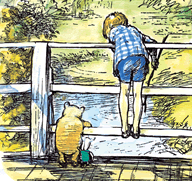 Introducing Winnie-the-Pooh and Christopher Robin, as well as Some Bees. 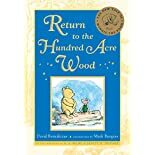 In this first adventure Winnie-the-Pooh goes on a remarkable honey hunt, including what is probably the oddest balloon ascension in history. 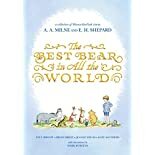 "This record, containing three of Pooh's comical adventures read by Maurice Evans, offers a very special advantage: it can be played over and over again, establishing the kind of friendly familiarity which so delights little people. 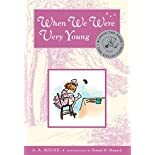 Indeed, many youngsters learn the stories by heart and gleefully chime in with the reading. 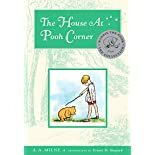 At the same time, the recording creates an eagerness to hear the rest of the Pooh stories, which are to be found in the two books, Winnie-the-Pooh and The House at Pooh Corner, as well as the verses in When We Were Very Young and Now We Are Six. 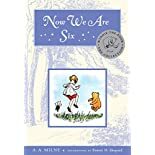 Obviously, this is a boon to parents who want to kindle, as soon as possible, a child's affection for books and reading." "Maurice Evans, one of the world's most celebrated actors, has been a star of the American theater since coming from England in 1936 to play Romeo to Katherine Cornell's Juliet. He also has created many unforgettable contemporary roles, especially that of the murderous husband in Broadway's Dial M for Murder. 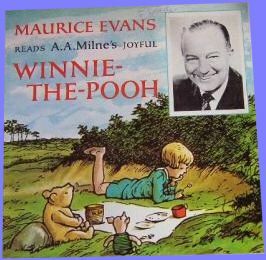 His interpretations of Milne's classic characters are considered unique among the many fine 'reading records' available for young people. 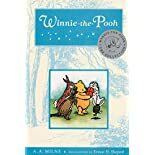 "'To hear Maurice Evans read the Pooh stories,'; says Warren Chappel, designer of the latest edition of The Pooh Library and a longtime friend of Ernest H. Shepard, 'is an experience akin to seeing the magnificent drawings for these stories for the first time. 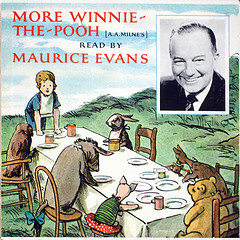 Evans gets as close to Pooh with his voice as Shepard did with his truly inspired illustrations.'"